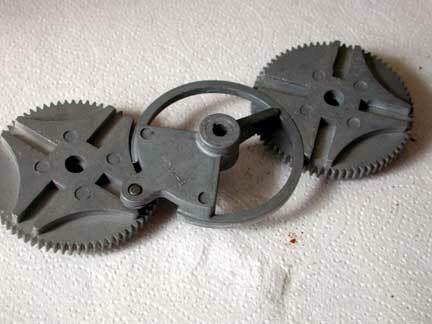 The center sprocket is driven by the motor. 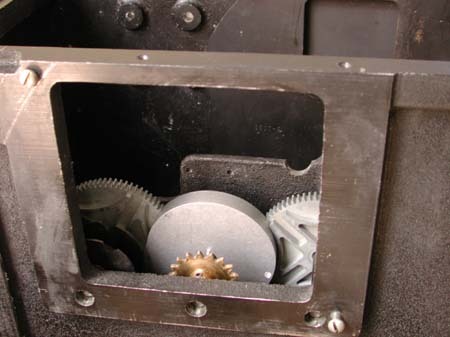 The shutter is operated by the right slot and the film advance is operated by the left slot. The pin is entering the right slot. Notice how neither geared wheel can rotate. 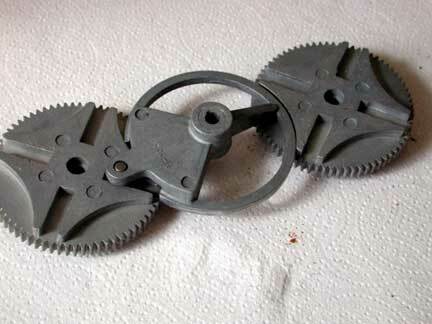 The pin has started turning the shutter gear. Notice how the shutter disc is opening at the very top right of the picture. The pin has rotated the slot about half way. Notice the shutter is open completely at the top right. The shutter is almost closed and the pin is now starting to leave the slot. The pin has left the shutter slot and is now traversing below the sprocket over to the left Geneva slot. This slot drives the film advance. While we are unable to see the pin enter the bottom slot on the film advance, we can see the Geneva slot start to rotate. Note how the shutter cannot move. The pin is visible now and the film advance is almost complete. The pin is leaving the left slot and is about to move over to the right for another cycle. The center circle is driven by the motor. This causes the pin to rotate in a circle. Note how the drive pin is entering the slot on the left gear. Also note how the right gear is prevented from turning because of the circumferance of the framework on the driven part, and this is called the stop. The Geneva mechanism turns rotary motion into intermitant motion.